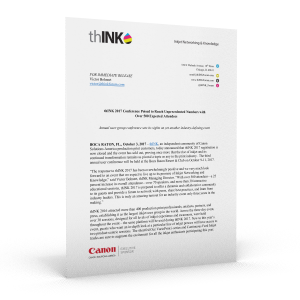 The first Inkjet Innovation Awards will honor innovation, forward-thinking strategy and excellence in inkjet printing. 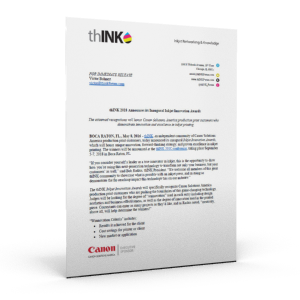 Read on for more information about the awards, winning criteria, and how to enter. The next thINK conference will be held at the Boca Raton Resort & Club on September 5-7, 2018. Read on to learn details and hear about new thINK Board of Directors appointments. 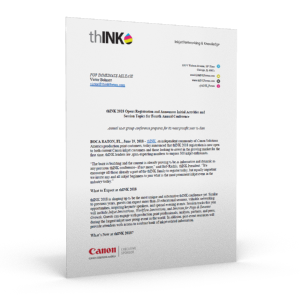 thINK 2017 registration is now closed and the event has sold out, proving once more that the rise of inkjet and its continued transformation remains as pivotal a topic as any in the print industry. 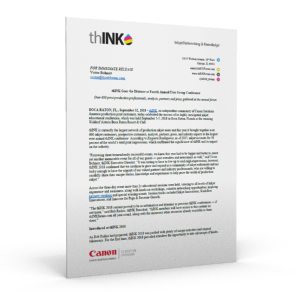 Registration is now open for thINK 2017. The thINK board also announced that Mark Kelly, Commander of Space Shuttle Endeavour's final mission, will serve as a General Session keynote speaker. thINK 2017, the user group's third annual conference, will be held at the Boca Raton Resort & Club on October 9-11, 2017. 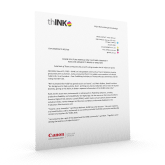 The event intends to bring together over 400 esteemed industry guests and educate members on the rise of inkjet and its continued transformation. For the second straight year, thINK's interactive, educational conference was an overwhelming and resounding success. 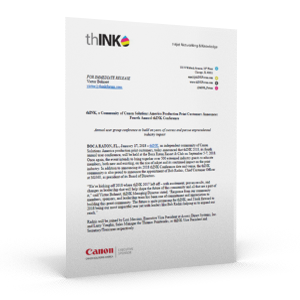 The event, which brought in record numbers establishing it as the largest inkjet user group in the world, was held October 10-12, 2016 in Boca Raton, Florida. 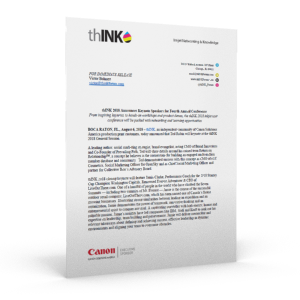 With two weeks remaining until its second annual conference, community of Canon Solutions America production print customers has already exceeded thINK 2015 attendance numbers and is set to host over 400 people at the world’s largest inkjet user group event.